As the weather warms, I find I want to spend less time in the kitchen than during the colder months of the year. For quick meals, I keep a stash of boneless chicken breasts on hand in my freezer. That way I always feel ready to pull a tasty dinner together quickly. This is one of those dinners. 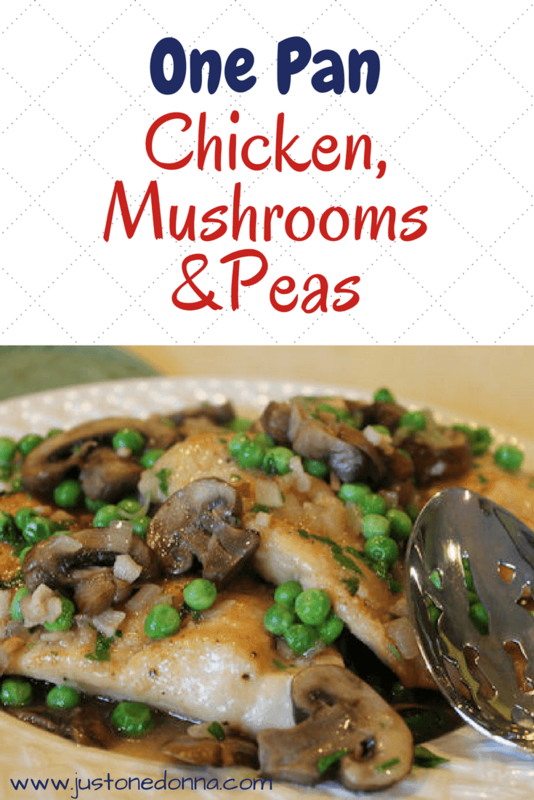 Chicken with Mushrooms and Peas is a recipe that takes just a few simple ingredients to make a satisfying dinner you can have on the table in thirty minutes. I love that this dish is a one pan recipe for those of us who aren't eating potatoes or rice. I like to serve a salad on the side for a dinner that is sure to please the pickiest eaters in your family. Add rice or mashed potatoes if that's your jam. There's plenty of yummy flavor in this chicken dish. The bacon, onions, and mushrooms add flavor and texture. The chicken stock makes a nice sauce and the vinegar adds brightness. My tip for you today, is to prep your chicken breasts before you freeze them. I like to trim all the fat from the chicken breasts when I take them from the package. Have you noticed how big and fat chicken breasts are these days? Well, when the breasts are large and thick, I slice them in half to make thin cutlets that don't need to be pounded. Then I wrap each cutlet individually in plastic wrap. All the cutlets then get placed is a freezer bag for long term storage. This makes it easy for me to take out just the amount of cutlets I'll need for my dinner and no prep will be needed. This recipe uses frozen peas because I always keep them on hand in my freezer, as well. You can, of course, use fresh peas. You'll just want to cook them a few more minutes than recommended for the frozen peas in the recipe. Mix together the flour, salt, pepper, paprika and garlic powder in a small bowl. Dredge the chicken in the flour mixture to cover. Brush off excess flour. Heat the oil in a medium skillet over medium-high heat. Brown both sides of the chicken and remove from the pan. Add the bacon and mushrooms to the skillet, cooking until browned. Add the onion to the pan, continuing to cook until the onion is soft and tender. Add the chicken stock and vinegar. Stir to release the yummy brown bits. Bring the mixture to a boil and add the chicken back to the pan. Reduce the heat to simmer, cover the pan and cook for 15 minutes. Add the peas and parsley, cover the pan and cook for 2 minutes more. Don't overcook at this point. Just a couple of minutes with the cover on will thaw the peas and keep them fresh tasting. Serve immediately. If you love this quick, one pan dinner please share on Facebook, Twitter, Pinterest, or Yum. I appreciate your shares! A big yes to simple, summer suppers. Thank you for posting, I am putting it on my plan for next week. I made the chicken, mushroom and peas tonight. It was delicious. The chicken was so tender even though it simmered for only 15 minutes. The light sauce was also tasty. I made whole grain brown rice and the sauce was delicious over the rice as well. This will be a frequent meal for our family also!! Thanks for giving this recipe a try. You are so right. It is surprising this dish has so much flavor with such a quick cook time. Yummy!